LG and BBC to demonstrate improved HDR 4K television at IFA 2016 | What Hi-Fi? 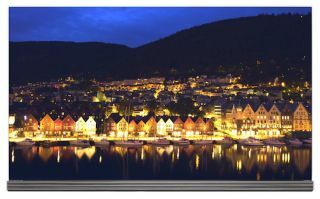 Only three months ago, the BBC and LG demonstrated how HDR could be streamed to an LG OLED TV at the SES Industry Days conference. Now, the pair have just announced that they will be showing how HDR technology will work in conjunction with High Frame Rate (HFR) and Hybrid Gamma Log (HLG) content. The two terms sound somewhat similar, but they are very different. HFR, an enhancement to Ultra HD television, is said to deliver 100 or 120 frames per second, resulting in smoother on-screen movement. The advantage of an HLG stream is that it can be can be decoded by both HDR and non-HDR receivers. As such, say LG and the BBC, it should "enable broadcasters to send HDR transmissions over cable and to provide streaming live content." This new addition to LG's exhibit at IFA 2016 will join its new range of wireless Bluetooth speakers designed for “active lifestyle audiophiles”, and its V20 smartphone, which will be the first to feature a 32-bit Hi-Fi Quad DAC built-in to achieve a higher quality of audio.